Once the visitor enters the densely shaded installation space where the „MicroSonical Shining Biospheres No 1“ by the artists' couple <SA/JO> (Sabine Schäfer and Joachim Krebs) are located, the consolidated and highly knowledgeable theoretical superstructure and foundation of their artistic work he/she previously has made him/herself familiar with by reading the placards and introductory texts or studying its fully deployed version contained in the appurtenant monographic catalogue, is reduced to a purely sensually perceptible audiovisual nature theatre. However, the visitor´s aesthetic expectations, developed on the basis of these introductory texts, as well as his/her perceptive awareness – with the installation addressing several senses at once – are subjected to a process that bears resemblance to what happened to sounds and images of nature in the creative process beforehand: both the visitor's perception and his/her awareness experience a sense of slowing down, of expansion in space. 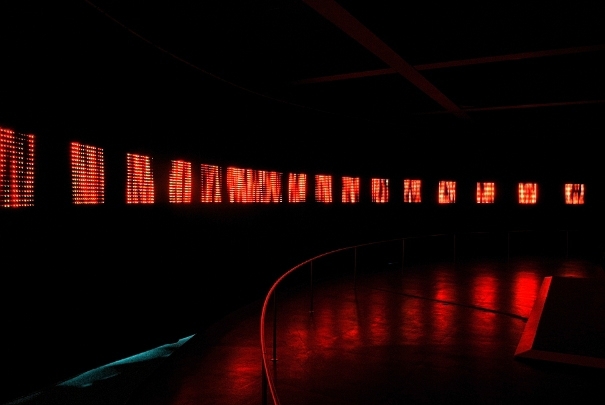 Starting from the abstract complex macro level, the visitor enters a microstructural cosmos, focusing his/her attention on the acoustic and visual details the couple of artists has subjected to microscopy and subsequently arranged in space, so that he/she inevitably lapses into a meditative condition. In this sense, the installation brings about a shift of perception and awareness. The ZKM's square-shaped «sub-room» positioned beneath the so-called «Kubus» in front of the landmarked building itself, has repeatedly housed installations, as most recently the light installation created by the artist rosalie. Now it is used for the presentation by <SA/JO> in the context of the eclectic festival programme celebrating the 20th anniversary of the Center for Art and Media (ZKM) in Karlsruhe. At the same time, this installation is considered the starting project for a future cooperation between the ZKM and the Karlsruhe Institute of Technology (KIT). A circular platform firmly fixed in the square-shaped room and reminding the visitor of the round revolving stages or substages found in theatre houses is converted into a media and perception stage in the centre of which four rows of comfortable onlookers' chairs are installed. The artist couple picks up this circular basic structure in the staging of their installation. With this project, the artist duo <SA/JO>, long known in the field of sound art, have for the first time combined their microscopic spacesound work with a light technology which offers an analogous potential for detailed modification: square-shaped LED panels are suspended from the ceiling, describing a semi-circle. The distances between the panels increase towards both ends mirroring the likewise increasing resolution of the visual field at the eyes' edges. In the centre, several panels melting into one bigger surface represent the focus of the visual field. The coarse grating, i.e. the pixel matrix of the LED panels normally used for advertising or large-scale projections allow the artist couple to transfer the microscopic approach they have refined in the auditive field in the course of more than ten years, to the visual level. In addition, the LED elements constitute a horizontal level evoking a feeling of width and space; simultaneously, the narrowness of the band offers further abstraction of the concrete image, complementary to microscopy. Both images and acoustic elements are founded on three basic material resources: Nature – animal – man. The images, broken down into light spots, show, in three clearly defined parts, three basic elements of nature: water, vegetation, fire. Correspondingly, each of the parts is dominated by one of the light colours blue, green and red. Each biosphere has its own related animal sounds – birds, insects, water creatures – which because of their mostly ritornello basic structure, display a homogeneous material character. However, an animal's voice never appears as an original recording, and neither in a «processed» form. «The point is, however», to quote the artists themselves, "that none of the sound substances is subjected to modification, processing or even alienation; rather it is only the intrinsic dimensions and perspectives that are changing, practically mutating, while the relations between pitches, rhythms and tonal colours remain constant." The animal voices are transposed, slowed down, decelerated to the point at which only the membrane of the loudspeaker vibrates rhythmically and the acoustic phenomenon is turned into a haptic phenomenon. The artists find their animal sounds by combing through immense bodies of archive material and subsequently by penetrating into the microstructure of the sounds they picked out. Sometimes, their frequencies are located outside of the acoustic range perceptible by man and are only made audible by slowing down the sounding material. Thus, even scientists familiar with animal voices might find it difficult to identify the individual species they encounter – virtually – in the installation. On the other hand, it is interesting to behold that the voices of the individual animal groups – amphibians, birds, insects – display increasing resemblance in the course of this manipulatory process, that is, it is the similarities of their sounds that are emphasized. Thus, sound microscopy opens up a spatial microcosm, enabling a system of space-sound control. The minute movements of the animals in nature are expanded in space through the quadrophonic positioning of the loudspeakers. In this respect, even the space-sound movements determining to a high degree the dynamics of the scenario are present in the sound from the start and are not staged artificially – actually, technical-artificial features play only a minor role in the installation, or to state it more clearly: abstraction always starts from the tendencies present in the material resources. The staging of the installation is based on selection and dramaturgy rather than on the individual sound phenomenon. This dramaturgy is aligned with processes such as acoustic mutations, spatial shifts, layering of sound patterns that are shifted in relation to each other or to which new ones are added. Thus, in close relation with the optical level but still avoiding any creative redundance there arises a constant movement in an interim space. The natural phenomena are enlarged, scanned and spatialized allowing them to enter into interaction with each other and thus build biospheres. The idea of transition or of an interim space is essential in the concepts by the artists' couple <SA/JO>: between concrete and abstract, between natural and artificial, – «you could also say that the intrinsic material of the original sound is developed into a desubjectivized expressive matter of the transformed fragment pattern» – and between the audible and the visual level. On his imaginary passage through the space-sound/colour-light body, the installation's visitor/listener will come upon some really unusual audio-light chimeras. About the author: Julia Gerlach, journalist, musicologist and cultural manager in the field of contemporary music, sound art and media art.